TrueBlock™ Technology completely covers everything underneath, so you can reuse file folders again and again. Ideal for labeling files that require multiple lines, larger font sizes or graphics. Guaranteed to stick and stay! TrueBlock™ Technology completely covers everything underneath, so you can reuse file folders again and again. 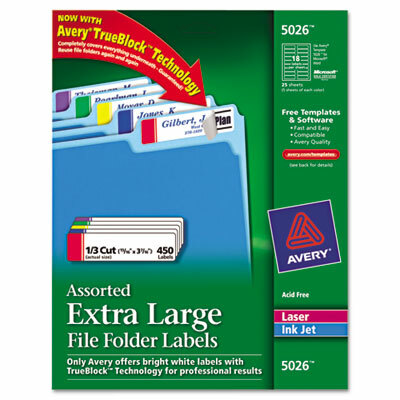 Ideal for labeling files that require multiple lines, larger font sizes or graphics. Guaranteed to stick and stay! Easy to use with free Avery® templates and software. See product package for details. Laser and inkjet compatible.